Well it’s an off week for the NASCAR races this week…but that doesn’t mean that there isn’t stuff pinging around my head like lugnuts during a green flag pit stop. While I still do not necessarily agree with some of the things Brad says (especially about what kind of comments someone with a “stake” in the game should be able to make in the booth) I think it’s interesting to hear what he had to say about the situation. 2. Speaking of Jeff Gordon- there is a biography of Jeff coming out in October that I can’t wait to get my hands on it. You can be sure that this book (Jeff Gordon: His Dream, Drive & Destiny, scheduled to release October 18th, by author Joe Garner) will be reviewed for Amy’s #NASCAR Reading List if I have to buy the sucker myself. You can read and excerpt here and order it from the Jeff Gordon store and get some extra digital behind-the-scenes goodies as well as a poster shipped with your book. 4. I wanted to share another great article from Kristen Schneider of Skirts and Scuffs. This one is about FoxSports1′s Danielle Trotta. It’s a great read: Danielle Trotta Talks Television, Breaking Barriers, and Giving Back. You know that I am a huge fan of Skirts and Scuffs and this article is another shining example of why. 7. 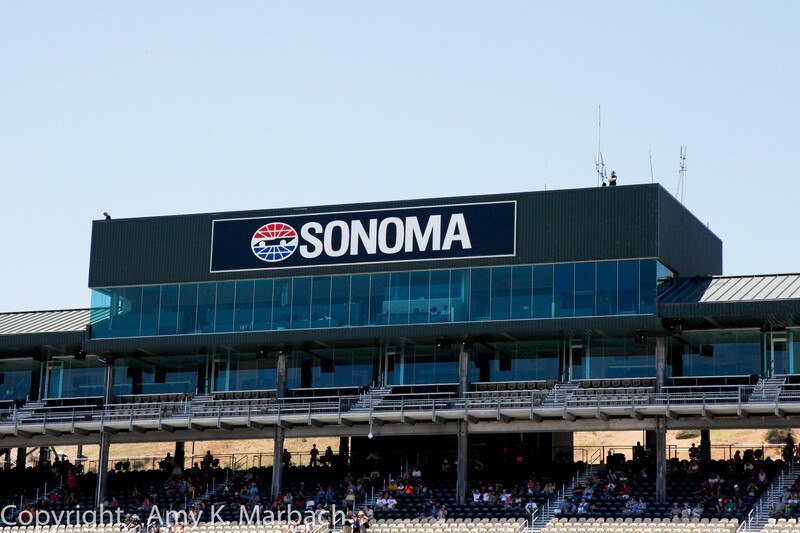 Like Mike said- it’s Sonoma this race weekend- and that is the closest track from my house that the NASCAR Sprint Cup Series runs at so you know Misty and I will be there. I pick her up at the airport Thursday night and we will be at the track on Friday! The best way to keep up with us at the track is to follow our respective twitter accounts: BadGroove (mine) and Fyrstorm24 (Misty’s). This also means that posting will be light here until I get back and into the swing of things. 8. Don’t forget if you are going to be in Sonoma and want to meet Tony Stewart- check out the special VIP Experience at Sonoma Raceway that the Tony Stewart Foundation has put together for diehard Tony fans. It’s one of those once-in-a-lifetime type deals and I suggest that you sign up today!! 9. Speaking of the Tony Stewart Foundation if you are planning to be at Eldora Speedway on July 20th for the NASCAR Camping World Truck series race you might want to keep checking the Tony Stewart Foundation website because they plan on soon taking spot reservations for the “Flip It For Good” Attempt to get into the Guiness Book Of World Records for the largest game of Heads Or Tails that will feature Tony Stewart as the official Head Flipper. $10 will get you a reserved spot in the attempt that will take place on the little Eldora karting track prior to the event. Sounds like great fun…too bad I won’t be in Indiana until the 22nd! Grr. 10. Here is an article about the ThorSports Fire and clean up efforts from Fox Sports- they WILL be in Iowa this weekend! For those unaware ThorSports fields four trucks in the Camping World Truck series for drivers: Matt Crafton, Rico Abreu, Ben Rhodes and Cameron Hayley. The fire destroyed 40 percent of their race shop and they are currently working in a Kroger parking lot to get the trucks ready for Iowa.